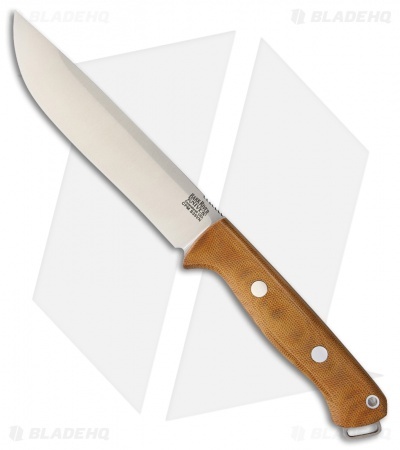 This Bark River Bravo 1.5 Field knife has an A-2 tool steel blade with jimping on the spine. It has a Natural Canvas Micarta handle. Includes a handcrafted leather belt sheath. The Bravo 1.5 has the same great design and build as the other two Bravo models, but its size is a happy medium of the two. So for those of you who felt the Bravo 1 was a bit too small or that the Bravo 2 blade is too long, this one's for you!